The dust clouds of the Milky Way are mostly dark, as is evident from a normal camera view of this part of the sky. The dark clouds contain gas and dust and are tightly constrained to the plane of the Milky Way. The dust hosts simple compounds that have condensed on the tiny grains and these molecules can be detected by radio telescopes. However, here and there stars have formed from the molecular clouds, lighting up the darkness. 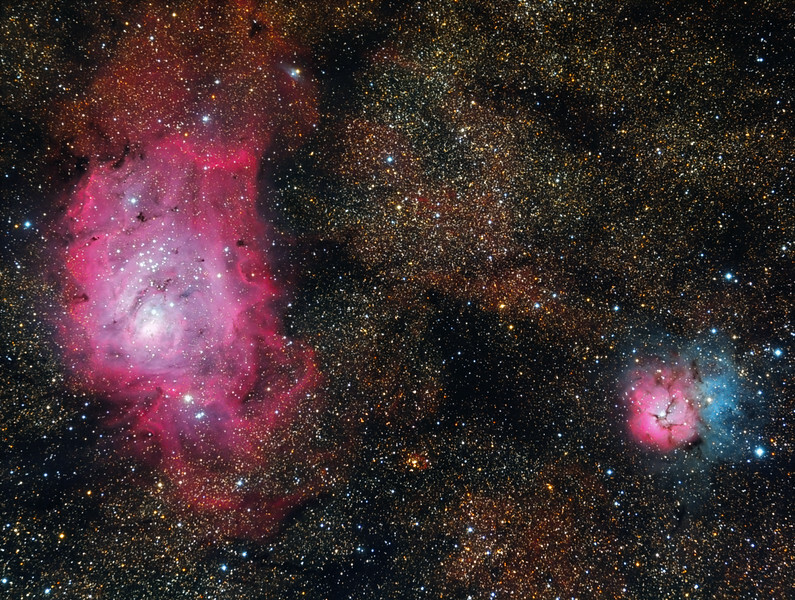 The brightest nebulae here are M20 (right) and M8 (left) can be seen with the unaided eye in Sagittarius, and were catalogued by Charles Messier over 200 years ago.